Abstract: Teaching a computer security course which includes network administration and protection software is especially challenging because textbook tools are out of date by the time the text is published. In an effort to use lab activities that work effectively, we turned to the internet. 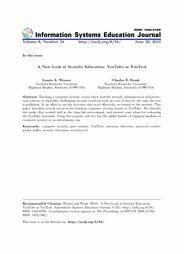 This paper describes several resources for teaching computer security found on YouTube. We describe the media that worked well in the class/lab environment, and present some ideas for evaluating the YouTube materials. Using this popular web site has the added benefit of engaging students in computer security in an entertaining way.